We are excited for the Assateague Lighthouse 2018 Schedule, out now! It was a good year, 2017. Here's a brief recap. CNHA hosted almost 40,000 visitors to the lighthouse in 2017 and in October we celebrated the 150th anniversary with food, music, kids games and an amazing opportunity to climb the lighthouse at night (photos here). We provided in excess of $88,000 in support to Chincoteague National Wildlife Refuge along with owning and operating the buses for the Refuge Treks throughout the spring, summer and fall. The CNHA also provided supplies and refreshments for special events on CNWR, including International Migratory Bird Day and National Wildlife Refuge Week. CNHA also supports summer interns who bring youthful exuberance in support of refuge staff who are often stretched to perform their duties and responsibilities. 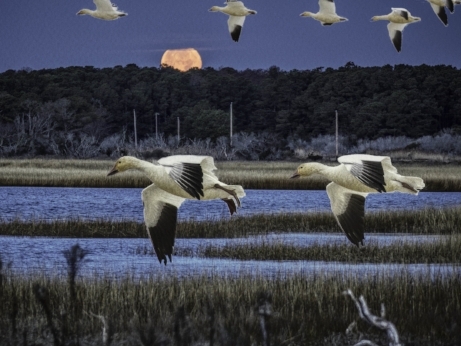 We believe our friends group is crucial to the mission of the Chincoteague Refuge, which is to conserve, protect and enhance wildlife and habitat here and in this great nation. The actions we take today determine the legacy we leave for tomorrow, but we cannot achieve our goals alone. Find out how you can help. The Assateague Lighthouse turned 145 in 2012. CNHA stepped forward and helped save it. Where did the ponies come from? It is an enduring question with few answers. There are stories. Find your favorite spot on the refuge. What's Happening at the Refuge Entrance?